Jonny Evans has been labeled disgusting for his part in the spitting incident between he and Papiss Cisse, with the FA finding him guilty despite his innocent plea, as reported by the BBC. The three-man panel have handed a six match ban to the Manchester United defender, while Cisse was given a seven match ban for his role. “The ordinary man in the street will find his action to be simply disgusting,” declared the panel. “It should not be allowed in any walk of life, let alone any football field. 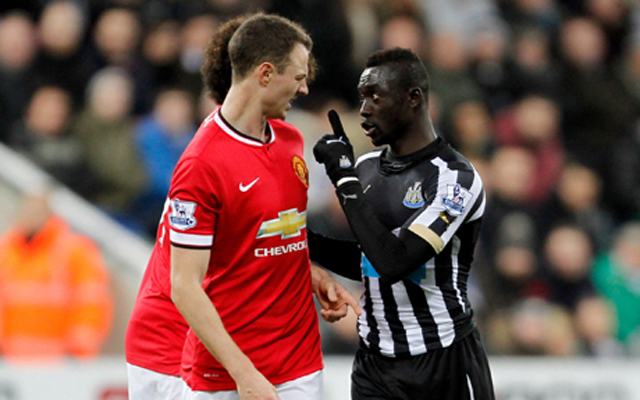 “It is clear that Mr Evans is looking directly and indeed aggressively at Mr Cisse. His lips are ‘pursed’ and he is close to Mr Cisse. “If he was, as alleged to be the case, a person who ‘habitually spits’, then the commission were concerned as to why he did not turn his head away from Mr Cisse when so spitting. Despite his previously stellar disciplinary record, the panel claim there was no reason to exempt him from punishment. Evans will miss a number of important games, including clashes with Tottenham, Liverpool, Manchester City, and Chelsea. United’s form has been far better this season with Evans in the team, so his absence could prove to be a huge blow.